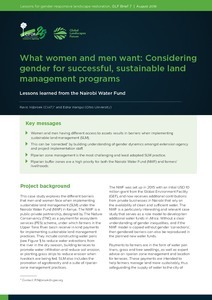 This case study explores the different barriers that men and women face when implementing sustainable land management (SLM) under the Nairobi Water Fund (NWF) in Kenya. The NWF is a public-private partnership, designed by The Nature Conservancy (TNC) as a payment for ecosystem services (PES) scheme, under which farmers in the Upper Tana River basin receive in-kind payments for implementing sustainable land management practices. They include constructing water pans (see Figure 1) to reduce water extractions from the river in the dry season, building terraces to promote water infiltration and reduce soil erosion, or planting grass strips to reduce erosion when livestock are being fed. SLM also includes the promotion of agroforestry and a suite of riparian zone management practices.